Nora Collyer studied for nine years at the Art Association of Montreal with Alberta Cleland, William Brymner and Maurice Cullen. In 1913 and 1914 she won scholarships at the Association.Nora Collyer taught art at Trafalgar School, Montreal, between 1925 and 1930, and she taught at the Art Association of Montreal in 1940. She exhibited her work at a number of the Canadian Group of Painters shows, and at the New York Worlds Fair (1939). Her first solo exhibition was at the Dominion Gallery, Montreal (1946), and she had a second show at the Walter Klinkhoff Gallery in 1964. Her work was the subject of a retrospective exhibition organized by the National Gallery of Canada in 1969. 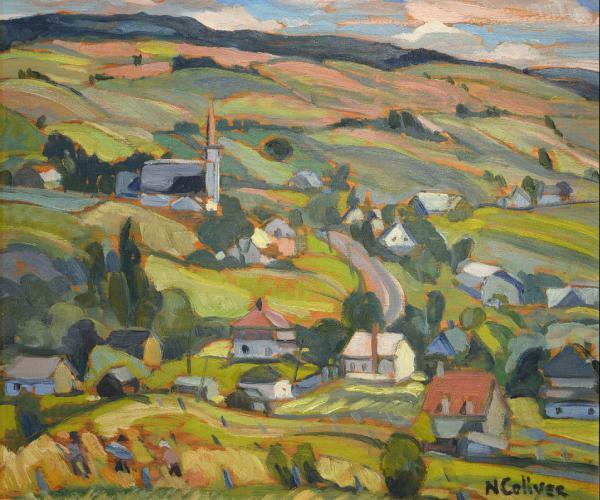 Nora Collyer was a member of the Beaver Hall Group, a group of thirty Montreal artists who exhibited together around 1921-22.